Children from schools across Sefton were treated to a hilarious and energetic story telling performance at Crosby Library to celebrate the launch of the Reading Agency’s, Summer Reading Challenge. 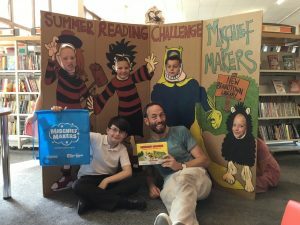 The challenge is a national scheme which Sefton libraries actively take part in every year, with around three thousand children getting involved. Statistically the borough is the number one performer in the North West for people completing the challenge successfully. During the summer holidays literacy for children tends to drop because youngsters are not in school being actively encouraged to read. The aim of the challenge is to tackle this by encouraging children aged 4-11 to read books for fun during break. After signing up to your local library you can complete the challenge by reading a total of six books. Children can read what ever they like – just as long as they are borrowed from the library. Young people receive a special reward every time they finish a book and there is a certificate for everyone who finishes. This years theme is Mischief Makers and it coincides with 80 years of the Beano comic. To kick off the event children got to watch a modern telling of Dennis the Menace and his adventure to find the Mythical Pea Shooter. Storyteller John Kirk brought the story to life with various wigs, accents and props. The interactive experience got all the children involved and the mere mention of the word water, led to a soaking from one of John’s many spray guns sending the young spectators into a frenzy.